As the summer festivals wind down, the live music continues to thrive in Chester city this Autumn. This October, online music magazine Soundsphere (soundspheremag.com) and Sourdough present their exciting second event in Chester, following their successful event last year. Northern music veterans, Soundsphere magazine was created back in 2008 and Sourdough was born in Chester in 2017. Last August they hosted their first event, the Sourdough All-Day Party at the ambient St. Mary’s Creative Space and featured a variety of musicians and DJs, including Chester’s Alx Green and Phlux. Sourdough are thrilled to announce that this year’s venue is The 2nd Floor on Upper Northgate Street, opened in April and is hailed for its independent art and fashion brands. The shop itself has close links with local music and is owned by Campfire Social’s Carrie Hyndman. The Sourdough x Soundsphere Halloween Party this year is no exception to talent and also includes an impressive mix of local musicians and artists from further afield, including The Floormen, Chupra Cabra and Brighton’s “noisiest power duo” Sit Down. 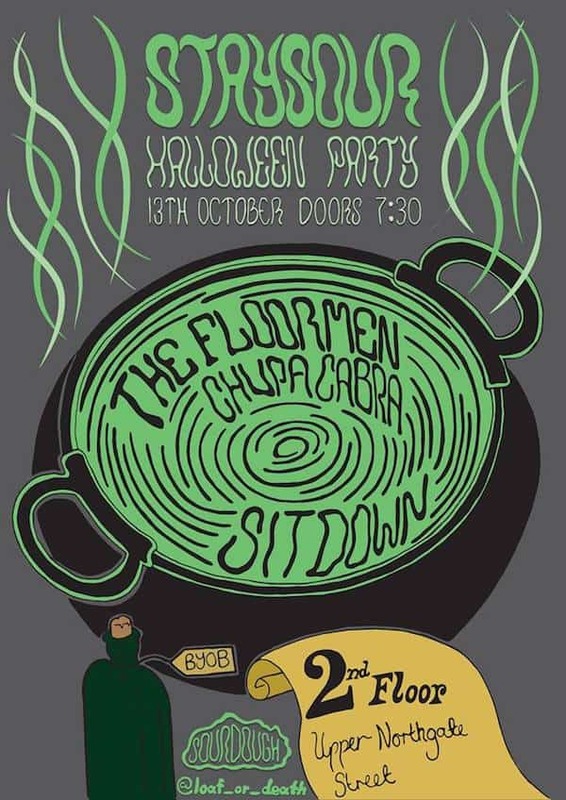 Liverpool’s psychedelic four-piece The Floormen have recently played the city’s Constellations Festival, and take inspiration from an eclectic variety of bands including Joy Division, Echo and the Bunnymen and Pink Floyd, an impressive mix that music fans won’t want to miss. Chupa Cabra are a three-piece band from nearby Deeside, and will also be bringing their individual punk sounds to The 2nd Floor. The group are no strangers to the city having played at Telford’s Warehouse and Chester Live, and have already been scouted by Radio 1 and Radio X. Soundsphere is championed for giving a platform to musicians and the Sourdough events are the perfect place to see new and up and coming artists. Brighton Band Sit Down, have recently returned from the Reading and Leeds BBC Music Introducing Stage. The duo, drumming vocalist Katie Oldham and guitarist Greg Burns began their musical journey in America, before settling in Brighton, and this October they’ll be bringing their quirky sounds to Chester. As the music and arts scene in Chester continues to grow, the gig at The 2nd Floor is a perfect venue for Cestrians to explore and express their creativity. Soundsphere x Sourdough Halloween Party will be at The 2nd Floor on Saturday 13th October.